I was moving along at my usual clip on my regular morning running trail when I was startled by the loud noise. I instinctively looked around for the distraction to my usually prayerful pace. Through a small gathering of trees the provocateur of the ruckus quickly became clear. It was a large earthmover beginning to clear an area for what I assumed would be a new home. As the days ensued and structural forms began to be assembled, my assumption was correct. As a person who appreciates architecture and construction, I actually was pleased to be able to witness the daily progress. It reminded me of the importance of building a solid foundation and a strong structure. It also reminded me of a two panel cartoon drawn by our own Missioner, Tim Hodapp, who shared his creation at the most recent meeting of elected bodies. The first panel showed a drawing of a church building with the church canons and constitution crushing the roof. The second panel again showed a church building, but this time the church canons and constitution were underneath the building serving as part of the foundation. On Sunday and Monday of this week, I spent a number of hours meeting with chancellors, laity, bishops and priests working on our canons and constitution. Given a choice, this would not be how I would spend my time. Likewise, I would not have intentionally chosen to spend countless hours this summer working on the combined budget for the Episcopal Church in Minnesota. 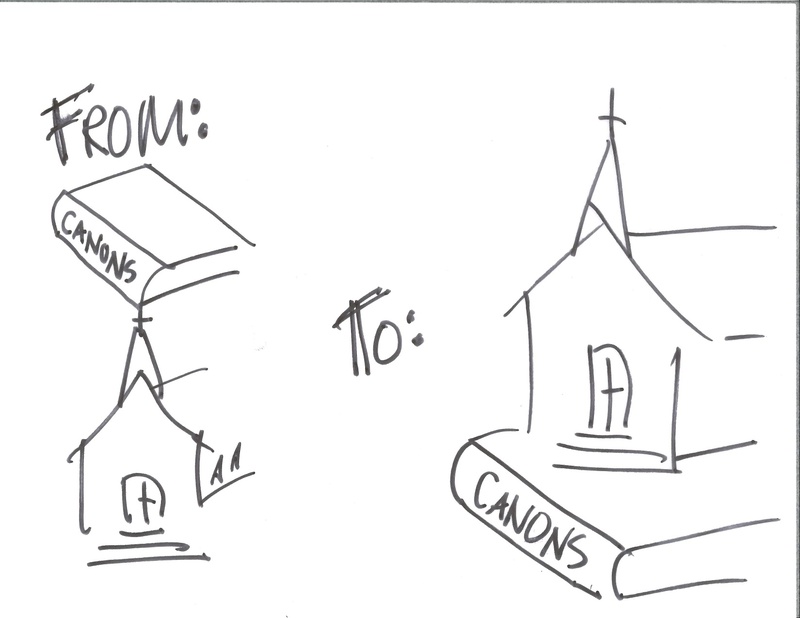 However, whether it be canons or budgets, they are a part of the foundation of our “church house”. They are not the house, nor that which makes it a home, but rather they provide part of the structure. Another way to illustrate this: the canons and budgets are tools to assist us to live the way we believe God is calling us to live. Canons and budgets on their own are not engaging God’s mission, but they provide the structure or tools to assist us in doing so. As such, I am supportive and grateful for those who use their gifts for ministry to do the structural, foundational work of canons and budgets so that the church can most effectively engage God’s mission.